Last updated by Shari Harley at March 18, 2019 . Giving feedback upwards is hard. Giving feedback downward is hard. Giving feedback to peers can be the hardest of all. We work closely with our peers. They’re often our friends. And still, we need to be able to speak freely when our coworkers violate our expectations. The key to being able to give peers feedback (to give anyone feedback) is to agree that doing so is not only acceptable but expected. Before agreeing to give and receive feedback, peers need to set clear expectations of how they’ll work together and treat each other. Telling people how you want them to behave is always easier than correcting a behavior. But it often just doesn’t occur to us to tell our peers what we want and need from them. We’re busy. They’re busy. And don’t they already know what courteous workplace behavior looks like? Return all emails within a day or two, keep your workspace quiet so others can focus, turn off your personal cell phone alerts at work, take personal calls away from your desk, and don’t wear anything scented at work. Aren’t all of these behaviors fairly obvious? Do I really need to people these are my expectations? Uh….yes, you do. If you don’t want employees dumping these challenges at their managers’ doors, help employees talk to each other. Schedule a meeting during which people working together can discuss the working environment they need to be satisfied and productive. Then facilitate a discussion during which the group creates 5 – 7 behavior guidelines each person agrees to follow. Post the list of agreed-upon behaviors on a poster that is large enough to be read from any place in the work environment, or virtually. Leave the guidelines posted indefinitely. Give each person in the group permission to talk to individuals who violate the guidelines. This is very, very important. For the most part, employees won’t tell a peer s/he is missing deadlines, gossiping, talking too loudly, has too many visitors at her desk, listens to music or videos without headphones, or is distracted with personal calls/texts. People will suffer in silence and avoid the offender rather than speak up about the behaviors that frustrate them. Ask the group to grant each other permission to speak up when guidelines are violated. Giving each other permission to speak up will make future conversations possible – difficult but possible. Without permission and these agreed-upon behaviors in place, people will suffer in silence or talk about each other, not to each other. Ask everyone in the work group to take feedback graciously, responding with “thank you for telling me,” rather than with defensiveness. Two weeks after making the list of guidelines, get the group together to review the list and make any necessary changes to it. Discuss behaviors that were omitted, aren’t realistic, and are realistic but aren’t being followed. Then follow up by facilitating a monthly conversation during which group members give honest feedback about which guidelines are being followed and which are not, and problem solve as a group. These conversations aren’t a chance to embarrass or call people out in front of a large group. If one person is violating a guideline, that conversation should happen individually. Group conversations keep the lines of communication open – which is essential to making working with others work. You will need a strong facilitator for the group discussions. The facilitator must tease out people’s thoughts, while making sure no one gets blasted in front of the group. Don’t let concerns, that you know exist, be brushed under the rug. Group members must openly and regularly discuss what is and isn’t working about their work environment, or frustrations will build, and unhappiness and dissension will ensue. It’s not too late to put these practices in place, even with a group that has been working together for a long time. Just schedule the conversation and explain why you’re having it. People will be relieved and grateful. That happened to me ONCE, and I swore it would never happen again. Too many people believe that if they do good work, the right people will notice and they will be rewarded appropriately. Part of this thinking is accurate. To be rewarded appropriately, you need to be doing good work. But the people in a position to reward you also need to know what you’re doing and the value you’re adding. You need to find a way to share the value you’re providing without going over your boss’s head, sucking up, or alienating your coworkers. Manage up tip number one: Ask your manager’s permission to send him a weekly update of what you accomplished during the week. This should be a one-page, easy-to-read, bulleted list of accomplishments or areas of focus. 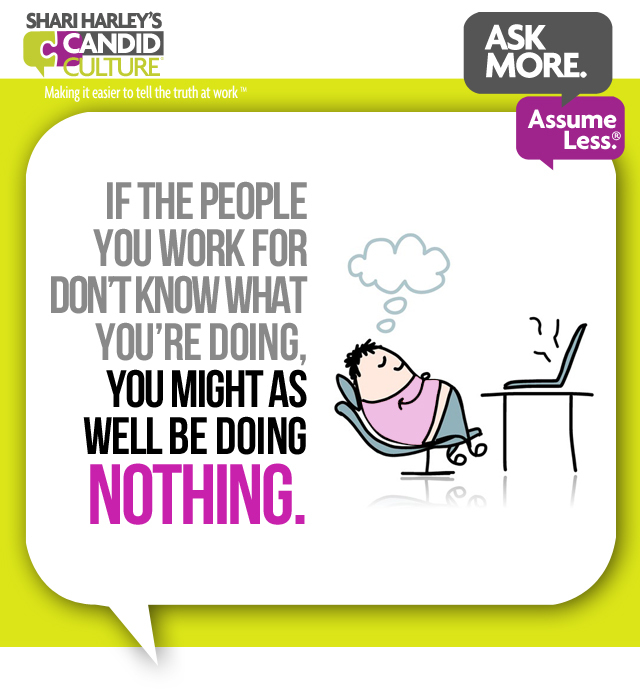 Your boss is busy and most likely doesn’t follow you around all day. As a result, you need to let him know about the work you’re doing. Don’t make him guess. Manage up tip number two: Periodically share what you’re doing with the people your manager works for and with. That can sound like, “I just wanted to share what my department is accomplishing. We’re really excited about it.” Ask your manager’s permission to do this and tell her why you want to do it (to ensure that the senior people in your organization are in-the-know about what your department’s accomplishments). If you’re not sure who can impact your career and thus who you should inform about your work, ask your manager. She knows and will tell you, if you ask. Manage up tip number three: Use the word “we” versus “I.” “We accomplished…..” “We’re really excited about….” Using the word “we” is more inclusive and makes you sound like a team player versus a lone ranger. Manage up tip number four: If you work remotely and don’t see your coworkers and manager often, make sure you’re keeping people informed about what you’re doing. Likewise, if you work flexible hours – leave early, come in late, and work at night – people will assume you’re working fewer hours than them and will talk about it to whoever will listen. So while the hours you work shouldn’t be anyone’s business, people in organizations talk about stuff like this. 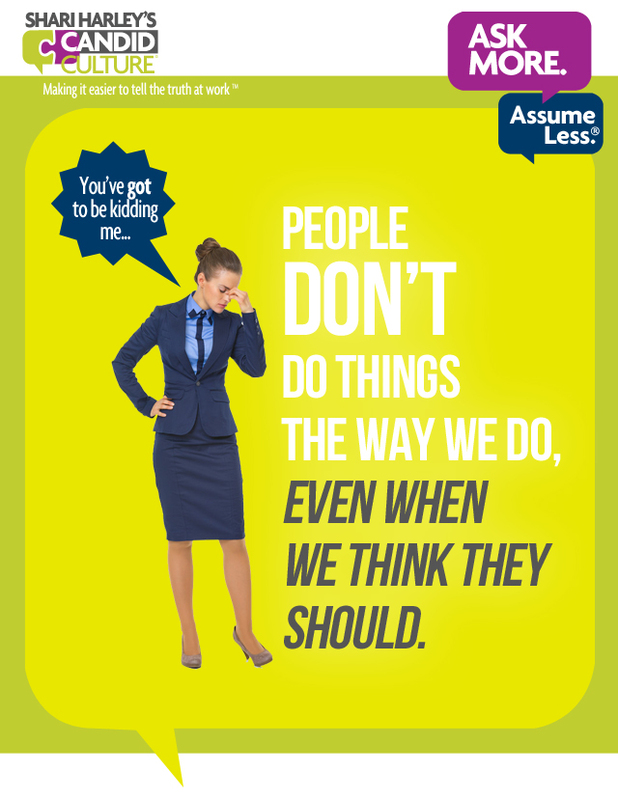 Don’t assume that people know what you’re doing or the value you’re adding to your organization. Instead, assume people have no idea and find appropriate ways to tell them. You are 100% accountable for your career. I’ll never forget sitting in a meeting with other department leaders, at my last job, and hearing that another department was working on the very thing that my department had been working on for months. We were a lean organization. No one had time for unnecessarily redundant work. And yet there were two departments working on the same project without knowing it. As crazy as it sounds, this isn’t uncommon. People often know very little about what others across their organization do. Sometimes people on the same team don’t even know what type of work fellow team members are doing. This lack of knowledge can lead to conflict (i.e. get off my turf), wasted resources, and stale ideas. If you know two departments are working to solve similar challenges, sharing ideas is likely to generate better solutions. Friday is National Swap Ideas Day. This sounds like a cheesy, invented holiday, but we’ve all been frustrated or constrained by a lack of sharing of ideas in our workplaces. So in honor of this invented holiday, here are five ways to find out what others in your organization are doing in the hopes of sharing more ideas and resources. Workplace Communication Tip #1: This will sound basic, but be sure to let the people and departments impacted by your work know what you’re doing. I.e., if you’re advertising a new product, let the folks in fulfillment know they need to staff up the day the advertisement hits prospects’ and clients’ offices or they may not have enough people to fulfill orders. I’m embarrassed to admit we’ve made this mistake at Candid Culture. Oops. Workplace Communication Tip #2: Create opportunities for departments who impact each other to communicate on a regular basis. Either literally get teams together quarterly to discuss what they’re working on, or if that’s not feasible, select liaisons from each department to meet regularly and discuss current and upcoming projects. What challenges are you having? What are you working on that we could do together? How could our departments work better together? Workplace Communication Tip #3: Widen your net and ask people you typically don’t have a lot (or any) contact with for their ideas on something you’re working on. Someone doesn’t necessarily need deep knowledge or expertise to offer a suggestion, they just need to think differently than you do. 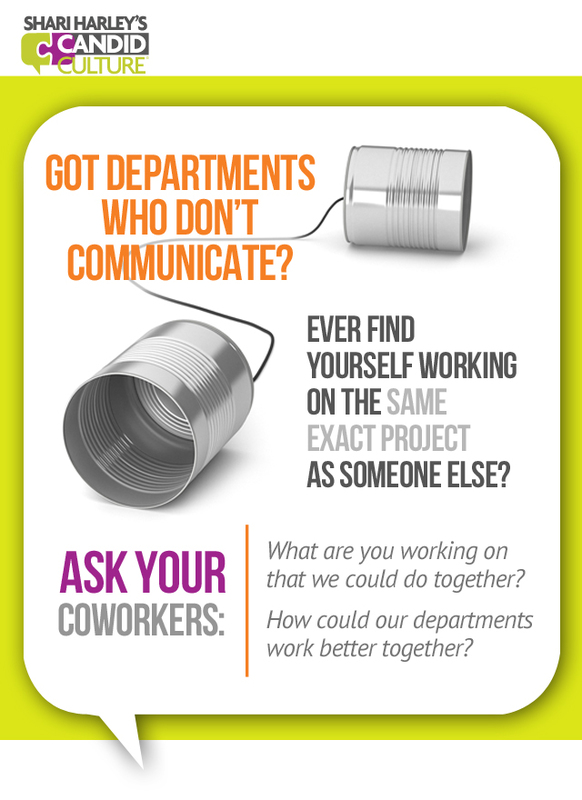 Workplace Communication Tip #4: Be open to help, new ideas, and sharing projects. It’s easy to feel threatened and territorial at work, thinking that if someone else can do what you do, that you become extraneous. It’s not easy to find employees who are hardworking, reliable, effective, and low drama. Bring all of those qualities to work, and you have nothing to worry about. So start sharing. Workplace Communication Tip #5: Keep up whatever idea-sharing practice you start. It’s common to try one of the ideas suggested above and then let the practice lapse when things get busy. Put processes in place to make sharing ideas the normal way that you work. You likely have enough to do. You don’t need to be working on projects that someone else is working on. And sometimes hearing how a coworker would approach a problem will give you a solution you need. Share ideas. Work together across teams and departments and maybe you’ll end working less. About fifteen years ago, I worked with a woman with whom I didn’t get along. We were on the same team and had the same job, but didn’t see eye to eye on how to approach work or solve problems. And when we didn’t agree, things got ugly. I have to admit to being afraid of her. She was nasty when things didn’t go her way. 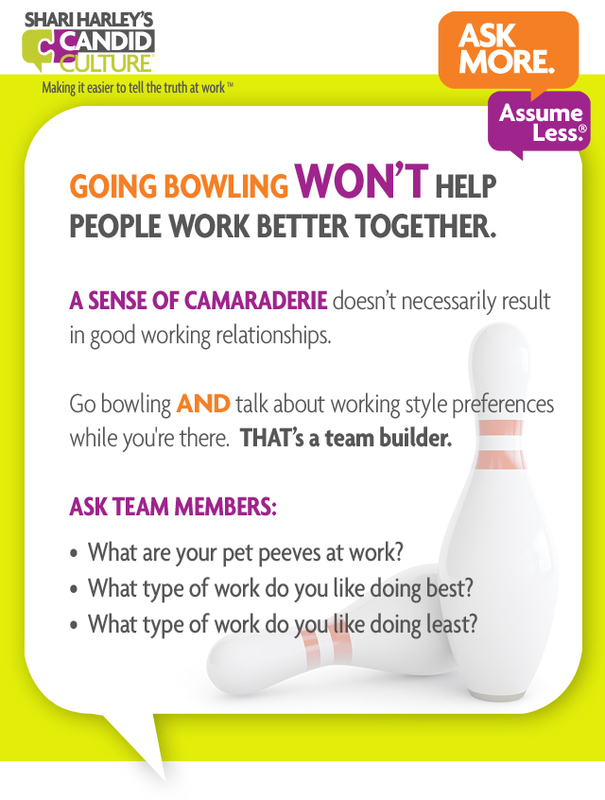 Lots of teams go bowling, to baseball games, and out for happy hour as corporate team building activities. And while team members may enjoy being together at these events and get to know each other better personally, they don’t learn team members’ working style preferences, the work others are really good at, and the things at which team members are not as good. 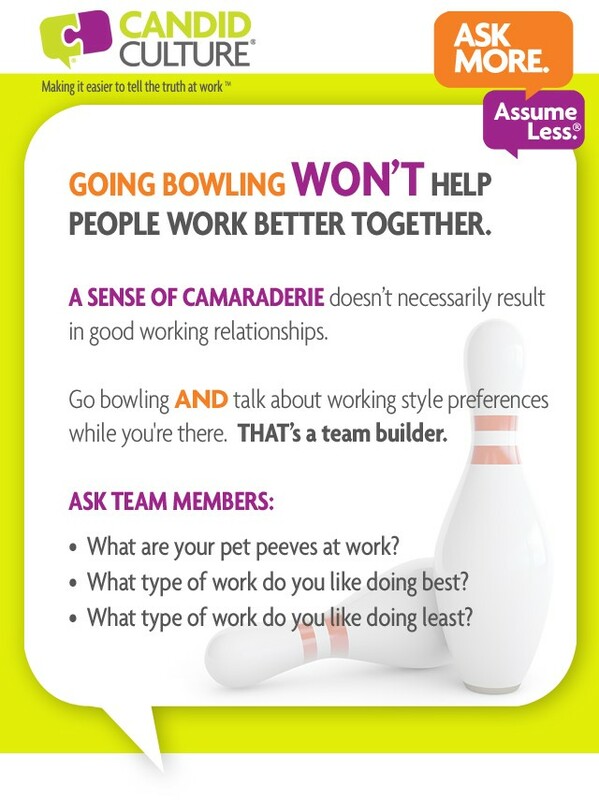 Go bowling or out for happy hour, just don’t expect people to work better together after doing those activities. If you want to do corporate team building activities, give team members a chance to learn about each other and themselves, and make agreements of how team members will work together in the future. Create occasions for candor. When I lead corporate team building activities, I put people in small groups, give the group a box of Candor Questions to Say Anything to Anyone, and time to answer the questions. One person in the group asks one question from the box. Everyone in the group answers that person’s question. The person who asked the question then answers his own question. Then another person on the team asks a question and so on. A great conversation always ensues. People talk about things they should have and wished they’re talked about when they started working together. Team members learn about each others’ work style preferences and what each person needs from both the job and each other. But most importantly, team members have permission to talk about things they normally don’t, and begin to create a climate of candor, which is essential for any group of people working together. For a team to work well together, it must be safe to tell the truth. Teams need to talk about the things that impact them most –each other. So go bowling and out for happy hour. But also create opportunities for team members to talk about the things that matter most –how they impact each other at work. Whenever I leave a job, the thing I take with me are the relationships. The projects and deliverables quickly become distant memories, but the people and the experiences we shared together stay with me. Some of my closet friends and the people most important to me in the world are the people I’ve worked with. It makes sense that we make friends at work; it’s where we spend a lot of time. And the people we work with make work fun or miserable. There is a considerable amount of research citing the connection between having good business relationships and employee engagement, retention, and high performance. When we feel we belong and have good relationships at work, we are happier and do better work. It makes perfect sense. As I’m writing this, I’m thinking about my coworkers with whom I spent weeks on the road, who endured a presentation, practice session for an upcoming town hall meeting that lasted until 1:00 am, and the coworkers I worked with in the World Trade Center. As much as I appreciated and cared about the people I worked with, I not sure how often I told them that they made my work world better. Valentine’s Day is a day we express appreciation for the people closest to us. 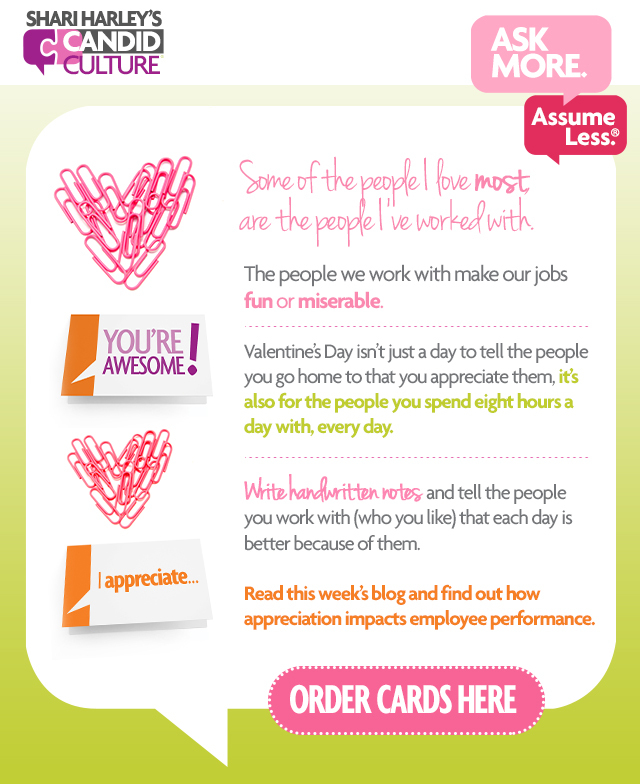 Don’t limit your appreciation to your loved ones at home; include your coworkers who make your work fun and who help you get things done. Of course, I hope you’ll tell express appreciation more than once a year, but Valentine’s Day is an occasion not to miss. Write the people you work with, who matter most to you, a handwritten note that they’ll keep for a long, long time. You can see our assortment of greeting cards for the workplace here. I’ll admit that I collect stationary and love giving and receiving handwritten notes. I suspect the people you work with will appreciate receiving a handwritten note too.